It ain’t easy. Your Scrum.org certification will hold more credibility with employers because you don’t receive it automatically after taking a course. You must pass the certification exam. Your PSM training gives you an excellent shot at achieving certification. Scrum.org’s courseware is uniform and rigorously updated and fine-tuned to ensure every participant receives valuable and actionable training from Professional Scrum Trainers. To be clear, uniform doesn’t mean boring! It means quality! 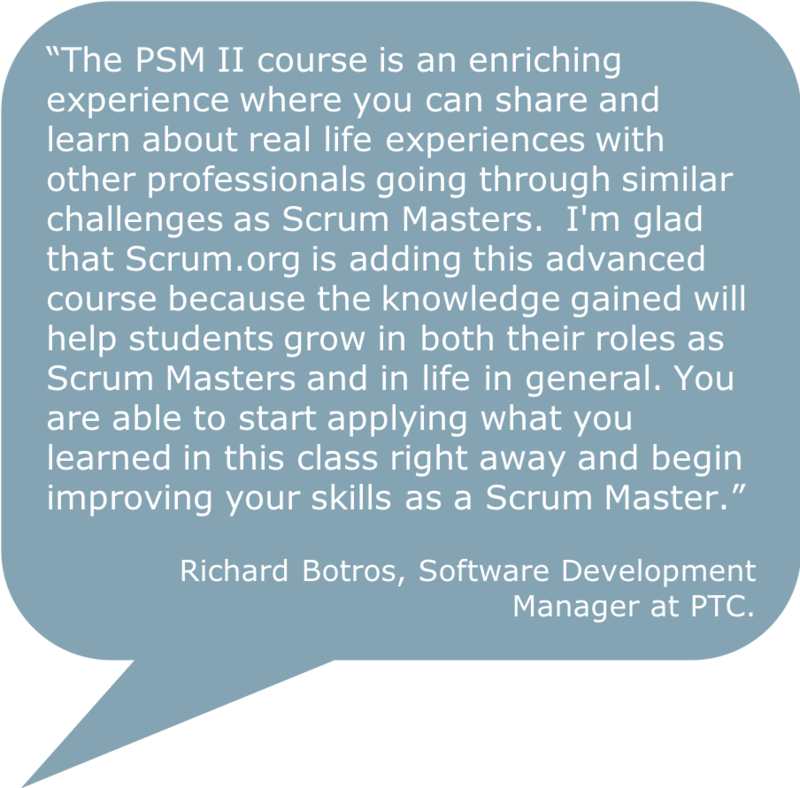 Students of Scrum.org courses are able to claim Project Management Institute (PMI) PDU credit: 14 PDUs after attending a two-day Professional Scrum Master II (PSM II) class. Please note that PMI PDUs are earned for course attendance and not for passing a Scrum.org assessment. Students can claim PDUs under PMI’s “Education courses provided by other third party providers” category. You can claim your PDUs online at https://ccrs.pmi.org. Trainer: Oded Tamir. Cancellation policy Up until 7 days before the event you can cancel at no charge. Afterwards you can either get a 50% refund or the option to apply your ticket towards a future workshop. General Terms: The course will open only if a sufficient number of participants is reached. AgileSparks reserves the right to cancel the course up to 5 business days before it starts.